Pyle's high-powered sound bar speaker system unlocks versatile and wireless music playback capability. Built-in Bluetooth and Wi-Fi connectivity allows music to stream wirelessly through your home theater entertainment system. Fill the room with full range stereo sound, along with impressive bass response to create a multimedia experience to remember. This fortified sound base speaker features exceptional stereo sound reproduction technologies that effectively recreate the entire audio spectrum in a powerful, form-fitting space. 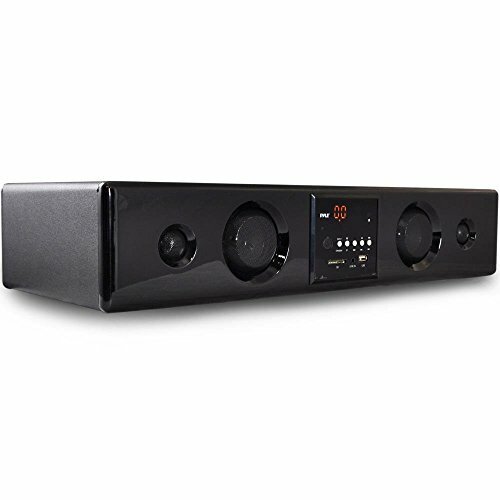 This surround sound system is super easy to use and setup -- connect it to all of your favorite devices (like your HD TV, Laptop, Computer, Smartphone, Tablet, Amplifier, Receiver, etc.). A total of (5) speakers generate vivid 3D sound, including a 5.25'' ported Mid-Woofer and dual 1'' Tweeters. The simple-styled cabinet housing is packed with next-generation sound processing technology that will make the next movie night, one to remember. Get connected and stream it all with the Pyle Wi-Fi Bluetooth Sound Bar Speaker System.